The rectory is home to rector of the parish Father O. Samuel Nichols and his family. 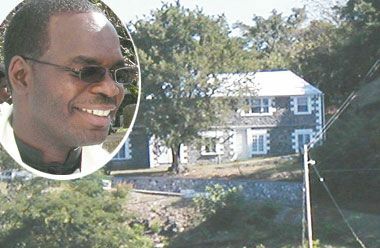 Father Nichols said, accompanied by his wife, he left home at around 6:40 Sunday morning to celebrate mass at the St Paulâs Anglican Church, a short distance away. Nicholls explained that after church, he left Calliaqua and was making his way to another parish for service, when his wife, who had returned to the residence, called at around 9:45 a.m. to say that their home had been burglarized. The burglar(s) made off with a quantity of items including a 32 inch LG television and a Toshiba laptop computer, Fr. Nichols said. Nichols told SEARCHLIGHT that the approximate value of the items taken is estimated at EC$6,000 and also includes cellular phones, jewelry, watches, personal beauty products and an undisclosed amount of US and Eastern Caribbean dollars. The burglar(s) entered the home through a piece of lattice work at the back of the house, he said. Nichols explained that the burglar(s) broke the pieces of wood which gave them access to the home. The couple and their children have been living at the residence for just over a year. The priest added this is the first time that he has had such an experience, nevertheless he said that he is not nervous. A meeting of his Parish Church Council was, however, scheduled for yesterday, Monday, October 10, to discuss security, Nichols said.